stall cleaning videos show Stall Shi*fters give excellent results. Featured below are three stall cleaning videos showing the advantages of stall cleaning a with a Brockwood Stall Shi*fter. The Stall Shi*fter cuts stall cleaning time by 65% compared to using a mucking fork. 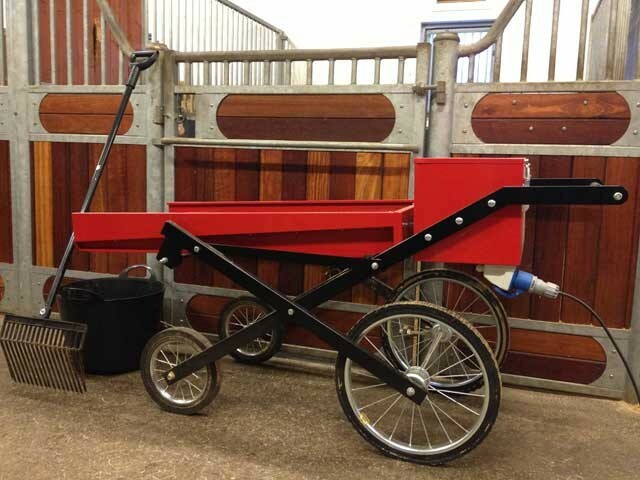 The Mallard Creek video shows an early Deluxe hybrid Woody model Stall Shi*fter® used with Mallard Creek dust free fine shavings. The 7-minute video shows an earlier model Little Shi*fter. The first video shows the European Union Brockwood Stall Shi*fter which is no longer available. The European version is functionally identical to the Deluxe Hybrid Woody stall shifter available here in the United States.The videos show the process of stall cleaning where all the bedding in the stall is passed through the sifting screen. One of the objectives of stall cleaning is to isolate as much manure as possible from the stall bedding material. Only the urine soaked bedding material should be placed in compost with the manure. We no longer make the all steel Little Shi*fter. It has been replaced with the improved Hybrid Woody Deluxe for 25% greater throughput. Stall Shi*fters are easy to order and we usually can ship the next day.